Finance ministry data shows 5% of Mudra borrowers from general & OBC categories cornered over 40% of total loan amounts sanctioned. New Delhi: Borrowers belonging to the general and OBC categories have cornered a disproportionately large chunk of Mudra loans, the Modi government’s flagship scheme to expand credit for the needy. 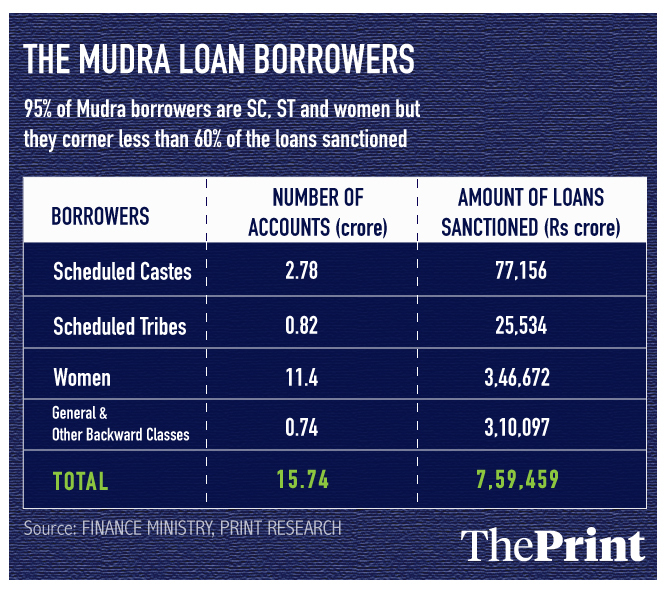 ThePrint analysed the data provided by the finance ministry to Parliament of loans given since the scheme was launched in April 2015 and found that 5 per cent of Mudra borrowers belonging to the general and OBC categories cornered more than 40 per cent of the loan amounts sanctioned. The remaining 60 per cent was sanctioned to 95 per cent of the borrowers — women and SCs/STs. The data did not provide the break-up for the general and OBC categories. The average ticket size of loans given to borrowers belonging to the general and OBC categories was Rs 4.2 lakh, the data showed. However, for women and SC/ST borrowers, the loan size averaged at Rs 30,000. Mudra was launched with an objective to provide collateral free loans to India’s self-employed to start or expand their own businesses. Being a pet scheme of Prime Minister Narendra Modi, banks were asked to aggressively lend to small entrepreneurs, especially women and those belonging to the backward castes. ThePrint reached Mudra CEO Aalok Gupta for comment but there was no response until the time of publishing this report. However, a person working closely with Micro Units Development and Refinance Agency Ltd (Mudra), the state-owned administrator of the scheme, defended the numbers. “The fact that 95 per cent of the borrowers are women and SC/STs shows that the objective of Mudra of ensuring credit availability to the unbanked has been achieved,” said the person who spoke on condition of anonymity. “Yes, in some cases they may not be getting credit equivalent to their demands. However, it is seen that these borrowers typically only need a small ticket loan,” the person said. According to National Sample Survey Office data, there are nearly 6 crore small and medium enterprises employing more than 12 crore people, a majority of them self-owned and run. The government estimates that a majority of these enterprises are run by people belonging to backward castes, economically weaker section societies and women and have access to only informal sources of credit. 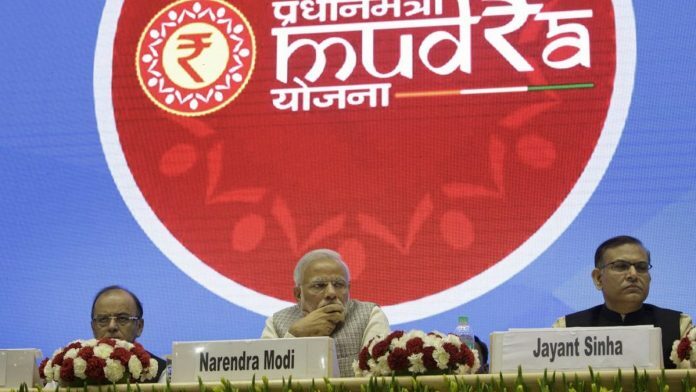 Mudra has tried to step in to bridge this gap through providing collateral free loans under three categories — Shishu (loans up to Rs 50,000), Kishor (loans between Rs 50,000 and Rs 5 lakh) and Tarun (loans between Rs 5 lakh and Rs 10 lakh). These loans are in turn guaranteed by the state administrator through a credit guarantee fund. Data shows that majority of the loans given are under the Shishu category. So far, in all the four years since the rollout of the scheme, banks and microfinance institutions have sanctioned more than 15 crore loans amounting to over Rs 7.6 lakh crore. Over 72 per cent of the total number of loans have been sanctioned to women. However, they were handed only 45 per cent of the total loan amount sanctioned. Nearly 23 per cent of the number of loans were to borrowers belonging to the scheduled caste and scheduled tribes constituting 13.5 per cent of the loans sanctioned. “Many of the loans are sanctioned to first time entrepreneurs who do not have any experience of business. Whenever they get an opportunity, their first instinct will be to take up any employment opportunity,” said Y.P. Issar, a retired general manager at Punjab National Bank who handled the portfolio of financial inclusion. “Besides some of the loans are given under the influence of local politicians,” said Issar. He pointed out that another problem is that banks always lend less than what is required by the business, causing constant working capital shortage. Determining credit worthiness of the borrowers, due to a lack of their formal credit history, is also becoming a big challenge for banks and other financial institutions. This has led to a sharp rise in non-performing assets (NPAs). NPAs of state-run banks under the Mudra scheme rose to Rs 7,277 crore as of March 2018, as against Rs 3,790 crore in March 2017 and Rs 597 crore in March 2016. To be sure, since a majority of the lending is done by microfinance institutions and small finance banks, this number could rise. The rising bad debts has prompted Mudra to develop an online loan appraisal system that will assess the credit worthiness of borrowers using artificial intelligence. The AI technology will be used to conduct lie detection, sentiment detection and psychometric tests by examining interviews of potential borrowers recorded on the online system, ThePrint reported on 15 February.